More resistant than steel, carbon nanotubes are one of the strongest and hardest materials known. Their impressive electrical and thermal properties make them an extremely versatile material. Hollow on the inside and only one-atom thick, they lend themselves to a large variety of potential uses, from tennis rackets and bulletproof vests, to electronic components and energy storage devices. New research shows that they may also hold the potential for revolutionizing medical research with magnetic resonance imaging of individual molecules. Scientists from ICFO- Institute of Photonic Science, in collaboration with researchers from the Catalan Institute of Nanotechnology (ICN2) and the University of Michigan, have been able to measure weak forces with sensitivity 50 times higher than what has been achieved to date. This significant improvement represents a turning point in measuring very weak forces and opens the door for magnetic resonance imaging at the molecular scale. 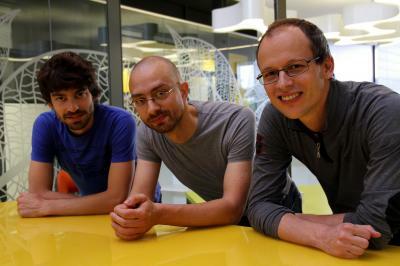 Dr. Adrian Bachtold, who began this research at the Catalan Institute of Nanotechnology before transferring his research group to ICFO, explains in an article published in Nature Nanotechnology that they were able to prepare the carbon nanotubes to act as probes that vibrate with an intensity proportional to an electrostatic force. With the use of ultra-low-noise electronics, the group led by Bachtold was able to measure the amplitude of the vibration of these nanotubes and thus surmise the intensity of the electrostatic force. "Carbon nanotubes are similar to guitar strings which vibrate in response to the force applied. However, in the case of our experiment, the forces that cause the vibration are extremely small, similar to the gravitational force created between two people 4500 km apart," explains Bachtold. In the last ten years scientists have made only modest improvements in the sensitivity of the measurement of very weak forces. This new discovery marks a before and after and points to carbon nanotubes playing an important role in future technologies for MRIs of individual molecules.